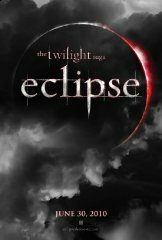 In “The Twilight Sage: Eclipse”, Bella (Kristen Stewart) once again finds herself surrounded by danger and is forced to choose between Edward (Robert Pattinson) and Jacob (Taylor Lautner). So basically same drama, different film. Fans of the series won’t have to wait long, “Eclipse” will drop June 30 and most likely make a buttload of cash for Summit who has yet to announce whether “Breaking Dawn,” which follows “Eclipse” will be one or two films.